Massapequa, New York, USA. August 5, 2018. Joint Campaign Office Opening for LIUBA GRECHEN SHIRLEY, Congressional candidate for NY 2nd District, and NY Sen. JOHN BROOKS has special guests including Gov. 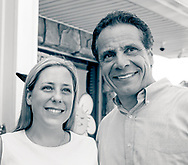 ANDREW CUOMO and Nassau County Executive LAURA CURRAN.